Boasting ten halls of fitness, wellness and health on a total floor space of approximately 160,000 square metres, 850 exhibitors and 136,000 visitors, FIBO is the world’s largest and most important fitness industry event. 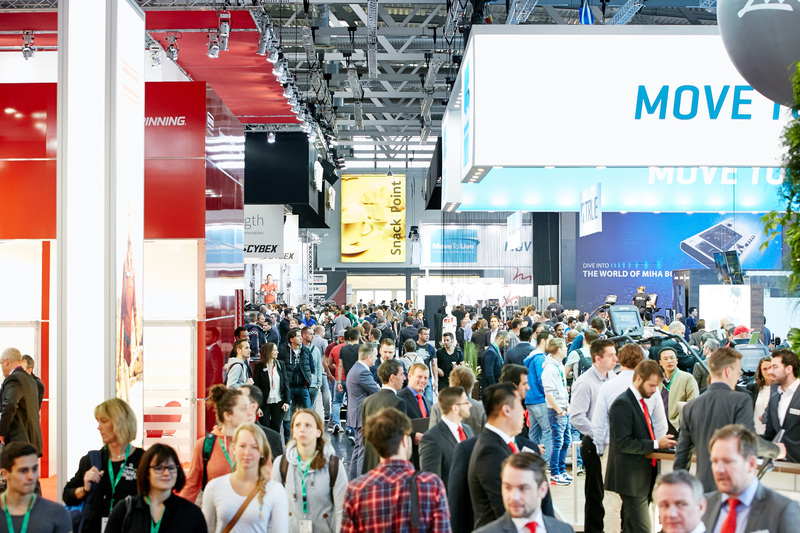 Each year in April, studio operators from around the world flock to the trade fair in Cologne to get an overview of the innovations in the industry. Divided into the three segments FIBO EXPERT, FIBO PASSION and FIBO POWER, the trade fair covers every aspect of the fitness industry. Since it separates exclusive trade visitor days on Thursday and Friday from the open-to-all weekend, it provides plenty of space for both business-minded pros and fitness enthusiasts. FIBO is far more than just a trade fair: thanks to a portfolio of industry events such as the European Health & Fitness Forum, international lecture series and a festival series for end customers launching in 2016, FIBO is a prime driver of growth in the fitness industry. FIBO EXPERT, FIBO PASSION and FIBO POWER will take place concurrently at the Exhibition Centre in Cologne from 7 to 10 April 2016. FIBO EXPERT is the international business platform for managers, distributors, suppliers, investors and decision-makers in the fitness, wellness and health industry. Exhibitors will showcase products and services in the segments Training Equipment, Med, Corporate Fitness, Wellness & Beauty, Sports Nutrition, Interior & Services, Consulting, Functional Training, Trading and EMS. Represented here will be international players such as Amer Sports/ Precor, gym 80, Johnson Health Tec, Life Fitness, MoveToLive, Star Trac and Technogym. All of them have booked large areas in the halls of the Exhibition Centre Cologne. FIBO EXPERT’s exhibition space will be expanded from four to five halls in 2016. The additional area in Hall 5.2 opens up a space for a current fitness-industry hot topic: EMS training. One of the themes dominating the fitness industry in coming years is technological progress. Hence FIBO EXPERT and FIBO PASSION will focus, at least in part, on digitalisation in fitness studios. New technologies ensure enhanced motivation and training efficiency. “Our biggest challenge for FIBO 2016 is definitely how to appropriately depict the digitalisation theme. We have to deal with the consequences of so many fitness industry spheres becoming digitalised. Exhibitors at FIBO approach this issue from vastly differing perspectives. Our goal is to tie it all together”, says FIBO Director Ralph Scholz. The emphasis will be on electrical muscle stimulation training, apps, online applications in studios, mobile devices and wearables. Innovations are central at FIBO. Symbolising these achievements is the FIBO Innovation Award, an event at which many major studio-related innovations have been introduced to a wider public. This year, it will take place with a new focus as the “FIBO Innovation and Trend Award”. In addition to the traditional jury decision, the audience will get a chance to vote for the first time. FIBO leads the way as the only trade fair of its size in the European market. Europe still is the largest and most important fitness marketplace worldwide. While some 9.1 million people were members of a fitness studio in Germany last year, that number surpassed 50 million across Europe. The European fitness market with its 48,000 facilities and 400,000 employees generates revenues of €26.8 billion. At the same time, a large share of the population remains inactive, which indicates that enormous growth potential remains: 59% of Europeans rarely or never work out. Numerous FIBO initiatives aim to address precisely this issue by raising even more public awareness for the fitness industry, encouraging debates and conveying innovations. Advance sales for the limited number of private visitor tickets are already underway. Some 35,000 tickets each will be available for Saturday and Sunday at the trade fair. Tickets are available online only. Trade visitor tickets are not limited, but registration with proof of work in the industry is required. Visit www.fibo.de/tickets. Visit the FIBO Travel Center to directly book selected FIBO partner hotels offering special deals for exhibitors and visitors.